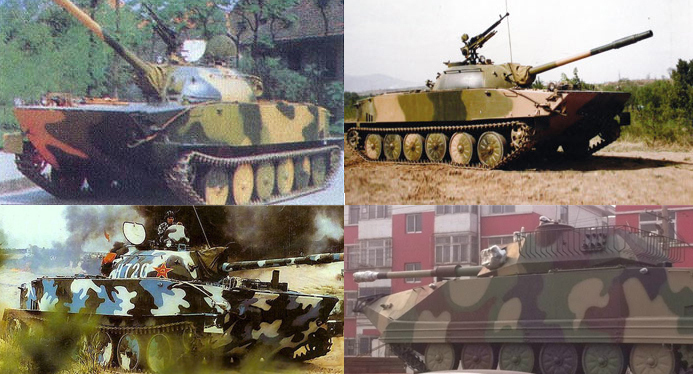 A Chinese version of the PT-76 ? Despite having strong resemblances and most probably strong influences in its design, the Type 63 was modified in several occurrences to met Chinese specifications, but still retains most essential features of the Soviet design as it was indeed, closely based on the Soviet design. 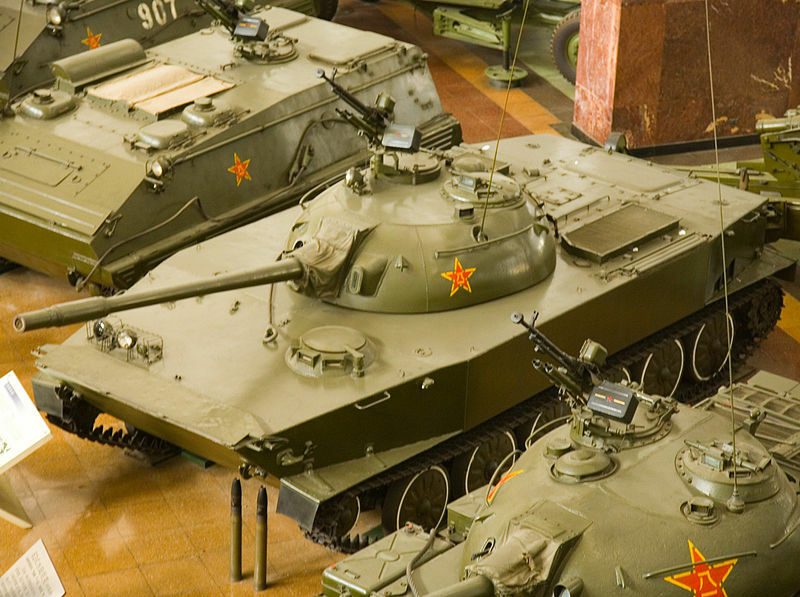 In any case, this first Chinese amphibious light tank filled a void in the ordnance and the project started after some examples of the PT-76 were obtained from USSR in the late 1950s. It was decided to develop in October 1958 an indigenous design, while keeping the most interesting aspects. Studies and development were led by the 201 Institute and the 615 Factory. The first step of this program was completed when a prototype, the WZ221 or Type 60 was tested in 1959. It served as a test-bed to detect many problems, one of which being engine cooling issues. The Army rejected the prototype and called in the Military Engineering Institute (MEI) and the No. 60 Research Institute of Fifth Ministry of Machine Building to refine the design that ended in 1962 with another prototype, which was passed on Norinco Factory 615 and the Shaanxi Weiyang Diesel Engine Plant for setting up the final production design. An extensive campaign was started to detect problems in various amphibious modes (at sea, lake, river…) and the final design was eventually approved in December 1963, hence the army designation. Its factory number was WZ211. Built with welded RHA plates, it is 11 mm thick at the front, 14 mm thick on the glacis, 10 mm at the rear, top and bottom. The compartmentalization of the Type 63 is similar, with the driving compartment at the front, fighting compartment behind and engine compartment at the rear. One essential difference was the three man turret crew for better efficiency, that goes with the turret, which looked similar to the one used by the Type 62 light tank. Another difference was the position of the driver, seated on the left side whereas it was centered in the PT-76. He has a three periscope hatch covering the frontal arc. The center one can be switched for a raised swimming periscope to see above the trim vane when erected. The hull is higher, deeper, and wider than on the PT-76, to provide for extra buoyancy at sea. The sloped front beak shaped was kept, as well as the general shape, narrower at the front and rear to improve seaworthiness. There is also a higher gradient of the bottom of the bow than on the PT-76. A large trim vane was installed on the beak, with hydraulic arms, to be erected when swimming, and prevent flooding the front deck and driver vision blocks. The sides are not completely flat, a slight bulge in the center could be observed. The engine exhaust grilles are also modified and there are three separate vertical slot side air inlets (instead of one per side for the PT-76). Preparations for swimming includes switching on the bilge pumps. Inside the turret which came from the Type 60 prototype and not the Type 62, both the gunner and commander behind took place at the left-hand side while the loader has had his station on the right-hand side. The turret itself had two hatches, but there was no real cupola. The commander had access to a forward-opening hatch equipped with one main periscope, based on a rotatable ring. 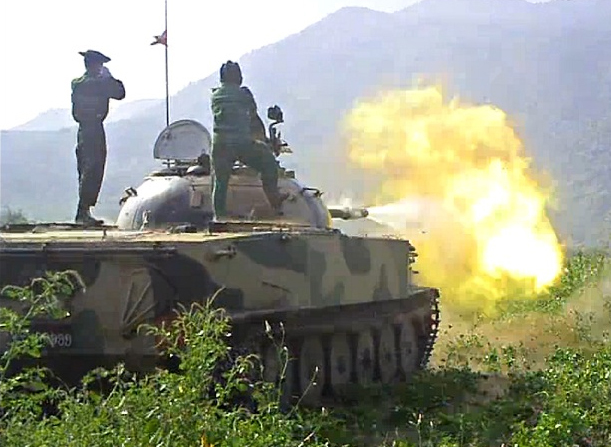 A provision was made to install a 7.62 mm Type 59T anti-aircraft medium machine gun. The right hatch opened backward and was surrounded by the ring for a 12.7 mm Type 54 anti-aircraft heavy machine gun. Between and behind them a small mushroom-shaped ventilation cap was installed. The rear had fittings for a snorkel. The main armament is the same Type 62-85TC rifled gun found on the Type 62 light tank, coupled with a coaxial 7.62 mm Type 59T light MG. There is also provision for a MANPADS. The gun is not stabilized and can elevate/depress to +22/-4 degrees. There are provisions for respectively 47, 500 and 2000 rounds, depending on the caliber. The main gun can fire a large array of projectiles, AP, APHE, HE, Frag-HE, HEAT, APFSDF-T and smoke rounds. Maximal range with top elevation is 12,200 m and 1,870 m in direct fire, with a rate of fire of 8 rpm for a trained crew. Known penetration value of the HEAT is 495 mm at 1,000 m and 360 mm of armor at 1,000 m for the APFSDF-T. However, accuracy must be of poor value compared to Western standards due to the lack of FCS, stabilization, and primitive, non-IR sight. There are two IR lights on the bow and one IR searchlight, right-hand side of the turret roof. Other equipment includes an A-221A internal telephone and an A-220A receiver/transmitter radio. The initial Type 60 was propelled by a 6-cyl. 4-stroke water-cooled inline diesel engine rated for 241 hp (180 kW) at 1800 rpm, that was used by the first production version, but it was replaced with the upgraded Type-63-I by a more capable 12150L-2 V12 liquid-cooled diesel engine, giving 402 hp (300 kW) at 2,000 rpm. This engine was kept on all other versions but the overhauled Type 63A. It is coupled with a manual, planetary transmission system with five forward gears and one reverse gear. Field performances are as follows: 64 kph on road, 30 kph cross country, 12 kph when swimming, 2.9 m wide trench crossing, 0.87 m high vertical obstacle, and could negotiate 60° gradients and 38° side slopes. This power is passed onto the rear drive sprockets while the tracks are running on six rubberized road wheels per side, each suspended by torsion bars, and idler at the front. Autonomy is 340-370 km depending of the speed and terrain, and 120 km when swimming. Total fuel capacity is 545 liters, augmented by external fuel drums. The basic type 63 was soon found under-powered and was replaced by the Type 63-I, propelled by the 12150L-2 12-cylinder in-line diesel. Overall weight rose from 18.4 to 19.83 metric tons. It was factory designated WZ211-1 and apparently most of the 1550 vehicles produced were of this type. 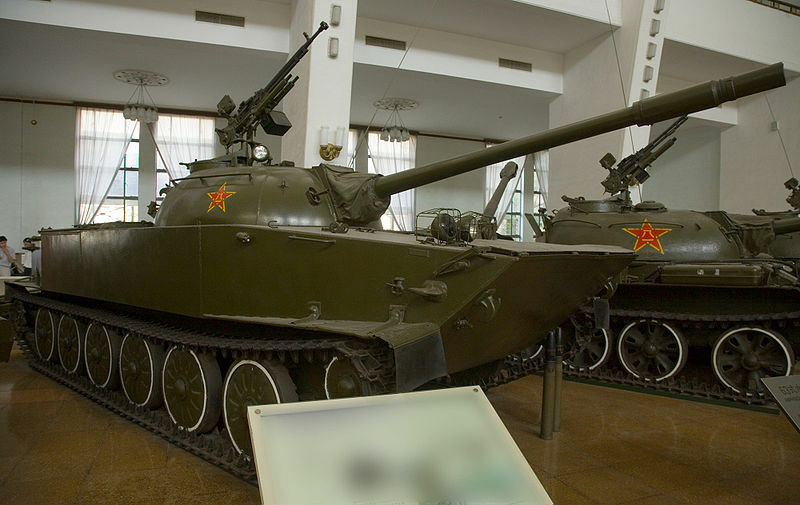 The Type 63-II is an upgraded, late version of the 1970s, with an infrared night vision equipment, a Norinco external laser rangefinder shared with the Type 59-I MBT, factory designated WZ211-2. The 2000s Type 63A upgrades are far more extensive will be treated apart in another file. The initials stands for “Hai Gai” of “Further Improved”, a prototype from the mid-1990s announcing the Type 63A, with improved amphibious capabilities. Rounded bow nose extension, redesigned hull for long distances seaworthiness, new 105 mm rifled gun instead (similar to Type 59-II, 59D, 69 80 MBT but with reduced recoil). The turret is modified accordingly, while retaining its half-egg-shape, three stowage buckets are placed on both sides and rear. This APC was derived from the same chassis, inspired by the BTR-50. it was declined into the Type 77-1 (equipped to mount an AT or howitzer on its deck), Type 77-2 fully amphibious version, Type 76 ARV and Type 89 self-propelled howitzer. Semi-experimental torpedo launcher vehicle Developed by Lushun Naval Base, and in 1975, the 201st Research Institute. After the Cultural revolution, the project was curtailed down to a few operational units for evaluation only, at the Lushun Naval Base. With both growing tensions with Taiwan and a fleet of obsolescent Type 63s it was decided a program of conversion and radical upgrade in several directions. First, due to operational conditions, sea travel speed and behavior in high sea was redesigned and the hull was entirely redesigned while the engine was upgraded to deliver the required swimming speed of 14 kph, in order to cover the 10 km separating their LST mother-ships from shore. Protection against mines and other waterborne threats (included speedboats) was also enhanced. The armament was completely overhauled as well, a new turret and gun from the Type 62G light tank was indeed installed, new sights, and a FCS. This new version was revealed in 1997 and known conversions so far in the 2000s concerned at least 300 vehicles. Operators outside China included Albania (200, scrapped), North Vietnam (Around 150 delivered before the falling out over the invasion of Kampuchea. First Encountered during the 1972 “Easter Offensive”, passed on modern Vietnam) Pakistan (50 in 1970-71), Burma/Myanmar (150 – delivered 1989-93), Cambodia (20), Sri Lanka (? ), North Korea (? perhaps confounded with the PT-85), Congo (8), Sudan (50 in 1978 and 2010), Tanzania (30 in 1977-79) and Venezuela (where it is used by the National Guard). The Type 63 saw action during the final phases of the Vietnam war, the Sino-Vietnamese War of 1979 and the Sri Lankan Civil War (1983-2009). Reports showed its great mobility over all kind of terrain and therefore its ability to create tactical surprise, but at the same time its great vulnerability to all kind of weaponry above small arms. The Shadocks – surviving PT-76 and Type 63s (pdf). Total weight, battle ready : 19.83 Tons. Type 63 of the standard production in green factory livery, 1960s. Another camouflaged Type 63-II now preserved and displayed at the Artillery & Aircraft park Minsk World, Shenzen. Chinese PLA Type 63A, equipped with the Type 63G turret, the current version of this amphibious IFV.